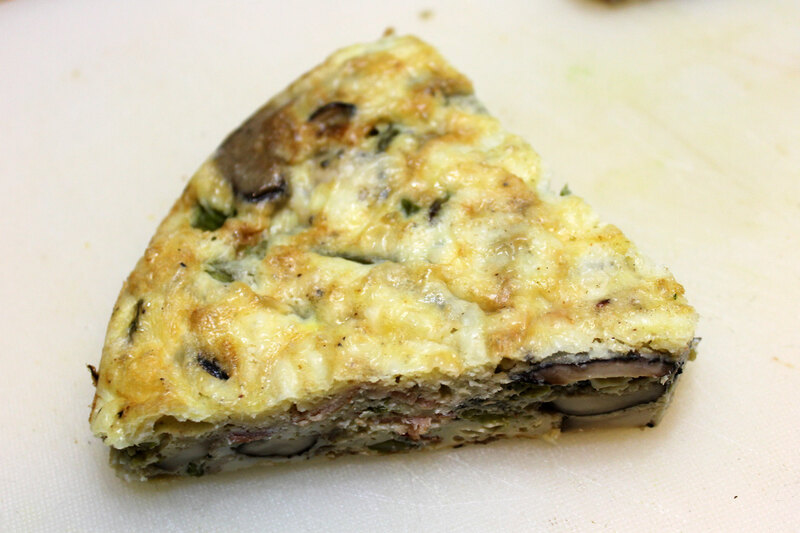 Crustless quiche is a fairly common lunchbox filler that I make for packed lunches. It also makes a great lunch, a light evening meal or would be good for breakfast. I take all the ingredients usually used in quiches with the exception of dairy products and put the in a baking tin without the crust. 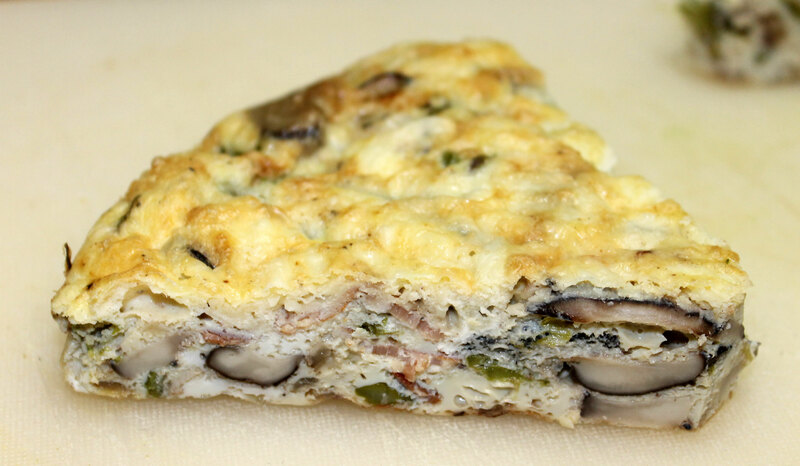 It is just as rich and satisfying as a regular quiche, but no gluten or dairy. And because you are not having to make the crust, it is really quick and easy to make. Eggs are a stage 2 reintroduction. When reintroducing foods on the AIP, I recommend this guide. Put the chopped bacon in a skillet and cook gently over a medium heat until the fat runs and the bacon is crisp. Remove the bacon leaving as much fat in the pan as possible. Add the onion to the fat in the skillet and cook until golden brown and soft. Add the mushrooms and cook until tender. Then add the chopped asparagus. Cook for a few minutes until it is a bright green colour. Mix the bacon, onion, mushroom and asparagus together in a bowl. Separately, beat the eggs with the coconut milk and season to taste with salt and pepper. Mix the egg mixture with the bacon mixture and pour the entire contents into a 9″ diameter circular baking tin. I use a silicone one for ease of removal. Put the quiche in the preheated oven and bake for 25-30 minutes until the egg is set and the top is starting to brown. This entry was posted in Recipes, Stage 2 Reintroduction and tagged dairy-free, gluten-free, grain-free, healthy, low carb, lunchbox, paleo, primal. Bookmark the permalink. Yum! This looks fab. I never used to like the crust on quiche even if buttery and flakie I found the combination too rich.